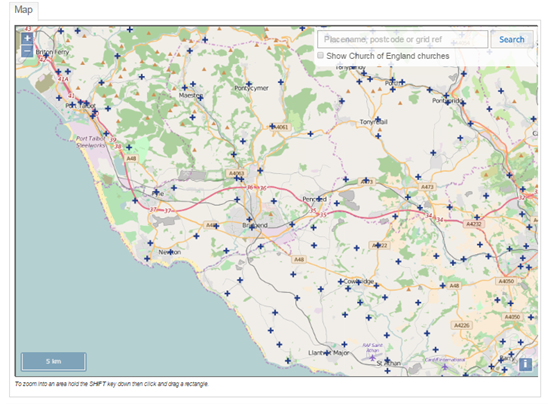 Church Heritage Cymru is a digital database of church buildings with integrated GIS. exeGesIS developed the system (which has shared development with the Church of England Church Heritage Record) in 2015 for the Church in Wales in order to capture information on all its churches. Church Heritage Cymru contains over 1,350 records for church buildings in Wales. As well as GIS information for each record, Church Heritage Cymru contains fields for a wide range of heritage data. Examples of this include church plans, architectural information, archaeological descriptions and statutory designation information. It is also possible to add details about building fabric and other church features using terms from the FISH thesaurus. The system also gives users the ability to link people (architects, authors, etc.) and sources (articles, manuscripts, etc.) to a number of church assets. There is also the option to enter information about worship times and facilities, as well as links to local church websites. The information contained within has been developed and added to through desk-based research and fieldwork reports, as well as through local initiatives and thematic projects. Further information from Crispin Flower.